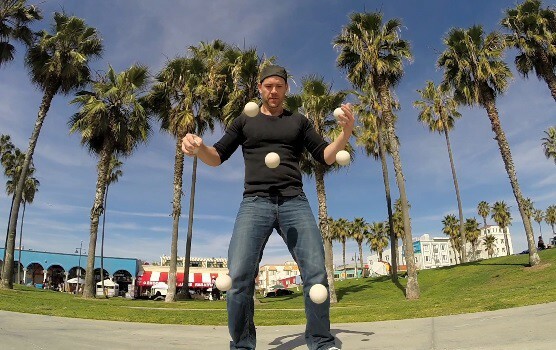 Bounce juggling in Venice Beach. Bronkar is the world’s only rhythmic juggling beatboxer. He holds multiple world records and has honed his craft with appearances all over the United States, Canada and Europe. He has been a featured act on Disney and Celebrity cruise lines, played at Madison Square Garden, and performed at colleges, corporate events and theaters around the world. He’s also been featured on television programs such as The Tonight Show with Jay Leno, America’s got Talent, Good Day Sacramento, Winnipeg’s Global TV and Univision’s Don Francisco Presents. Bronkar’s mission is to spread happiness, laughter and excitement one audience at a time.